o Manufacturer or Brand name is shown. o The "P" indicates the tire is designed for passenger vehicles. A "T" is the designation for a temporary spare tire. 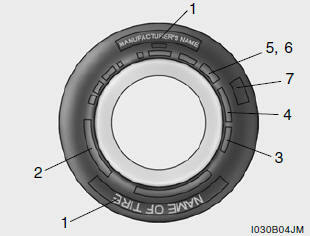 o Three-digit number (175): This number gives the width in millimeters of the tire from sidewall edge to sidewall edge. o Two-digit number (70): This number, known as the aspect ratio, gives the tire's ratio of height to width. o R: The "R" stands for radial. o Two-digit number (14): This number is the wheel or rim diameter in inches. o Two (or three) digit number (84): This number is the tire's load index. It is a measurement of how much weight each tire can support. o T: Speed Rating. The speed rating denotes the speed at which a tire is designed to be driven for extended periods of time. The ratings range from "A" to "Z" (98 to 186 MPH). o DOT: Abbreviation for the "Department of Transportation". The symbol can be placed above, below or to the left or right of the Tire Identification Number. Indicates tire is in compliance with the U.S. Department of Transportation Motor Vehicle Safety Standards. o 1st two-digit code: Manufacturer's identification mark o 2nd two-digit code: Tire size o 3rd three-digit code: Tire type code (Optional) o 4th four-digit code: Date of Manufacture o Four numbers represent the week and year the tire was built. For example, the numbers 3109 means the 31st week of 2009. The number of layers or plies of rubbercoated fabric in the tire. Tire manufacturers also must indicate the materials in the tire, which include steel, nylon, polyester, and others. The letter "R" means radial ply construction; the letter "D" means diagonal or bias ply construction; and the letter "B" means belted-bias ply construction. Tire manufacturers are required to grade tires based on three performance factors: treadwear, traction and temperature resistance. For more information, see Uniform Tire Quality Grading on page 8-15.